When you discover you have a love for Camo, there’s no sense is denying or hiding it! As a proud Camo lover, personalizing your car or truck is just one of many ways of showing off just how much you dig the Camo look. How should you go about customizing your truck with Camo? One easy, affordable, and awesome way is with Camo Seat Covers. The best part is that with these truck accessories, you won’t just be adding style to your truck; you’ll be protecting the original upholstery at the same time. Nothing better than a two-for-one shot, right? 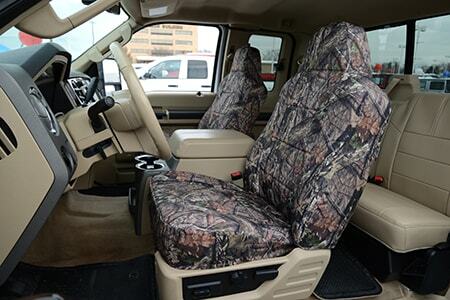 In this article, we’ll give you some of the best options on how to customize your truck interior with Camo Seat Covers. We have tons of styles of choose from so let’s get started. Our durable and waterproof, Realtree Camo AP Seat Covers are not just geared for hunters, but double as a great option for everyday use due to the neutral colors and tones of the AP pattern. The subdued and natural grays and browns of the design will complement many truck interiors. While the colors may be unobtrusive, the intricate design is by no means lackluster. Each branch, twig, patch of mossy underbrush has been placed strategically to create a Camo pattern so life-like you’ll blend into all your surroundings. A perfect pick to customize your truck that is used for any passtime or daily driving. 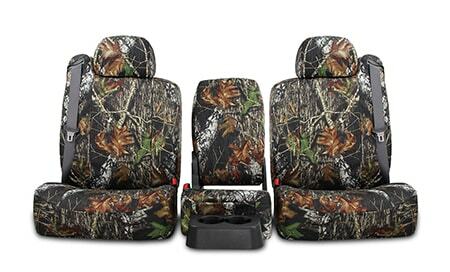 A newer addition to our Realtree Camo family are the very durable, waterproof Max 5 Seat Covers. Max-5 has become an instant favorite among Camo lovers. With waterfowl hunting being the main focus for this camo (like Max-4 which we will get to next), the pattern features all things found in the open fields. Cattails, reeds, oak leaves, flooded marshes, with the added realistic touch of sunflowers and wheat are all there to maximize the realism. 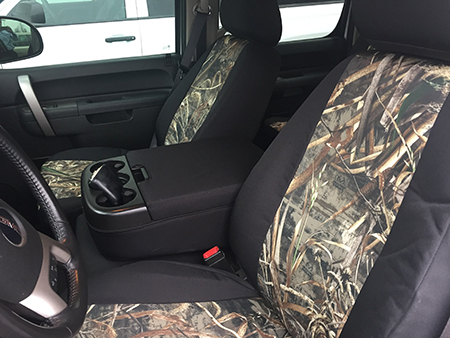 While our Max-5 Camo Seat Covers add a layer of invisibility to your truck’s interior, it also adds a layer of protection. The 600 Denier polyester/nylon blend fabric will stand up against any hunting gear, work tools or activewear. Known for its ability to hide in plain sight while duck hunting, our Realtree Camo Max-4 Seat Covers are also know for being highly protective, waterproof, and abrasion resistant. Plus, they look awesome! This wetland camo pattern has become one of the most popular Realtree Camo designs out there - and for good reason! The immaculate attention to detail in each placement of cattails, millet, oaks, maple leaves, corn stalks, and sunflowers create a highly effective hunting camouflage for waterfowlers. Although this material was designed with hunting in mind, its popularity extends farther than the wetland terrain and makes for a beautiful set of seat covers in any Ford, Toyota or Dodge truck. Another awesome way to customize your truck is with Kryptek Typhon Seat Covers ShearComfort’s Luxury Line (we will explain more about customizing your truck with our Luxury Line after we go through the styles). The stunning Typhon Camo pattern has eerie grays and stealthy blacks to create a dark design for those who drive fearlessly into the deep, dark night. 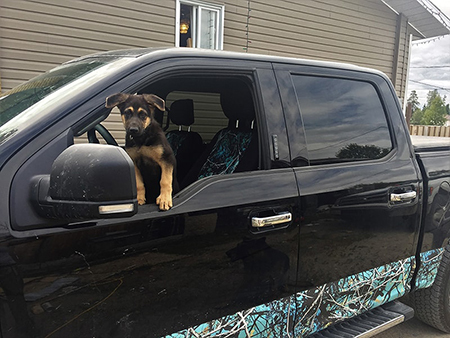 This cool camo truck accessory will enhance your interior by adding a rich, but dark color scheme with the added touch of the awesome Camo design. Whatever nighttime adventure you seek, your truck’s seats will blend into the darkness and be protected with this rugged, 600 Denier polyester/nylon blend, material. Another Camo pattern from our Kryptek Seat Cover Luxury Line, our Kryptek Raid Seat Covers, are another effective way of customizing your car interior with your favorite camo pattern. The urban pattern is made of gray tones and shadowy blacks create a high definition Camo design suitable for the daily driver. Made for the Urban hunter, you’ll blend your truck’s interior with the city surroundings, all while giving you maximum protection from daily wear and tear that a hunter needs. The Raid pattern will complement many truck interiors, whether black or gray. Kryptek Highlander Seat Covers are a cool truck accessory for the camo enthusiast. The Highlander pattern, designed for versatility for all types of terrain, has natural brown and beige colors. 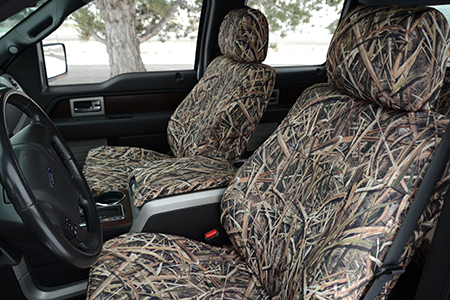 These all-terrain Camo Seat Covers aren’t only for hunters, but for all types of truck users. As all terrain-hunters, you need a Camo that blends into many surroundings and climates. The industrial material makes it is easy to keep your seat protected regardless of the terrain or daily use and will look great in many interiors, including tan. You can go one step further with our Kryptek Camo Seat Covers and pair your favorite Kryptek pattern with our Exotic Line. Now that’s real customization of your truck’s interior! 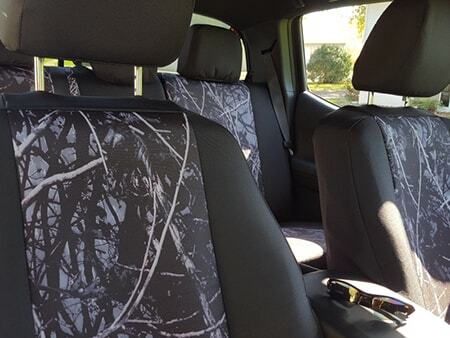 Photo Credit: Contest Winner Ron W.
Head to the outback with our Harvest Moon Shine Camo Seat Covers. The highly detailed Harvest Moon design embodies the stealthiness of a successful hunter with its dark shades of grays and deep blacks. Suitable for a noble, assertive, and patient hunter. This camo pattern conveys your abilities for the game. 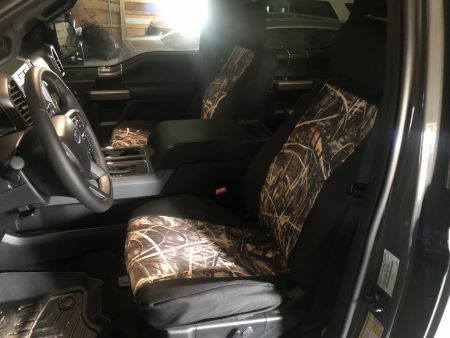 Adding Harvest Moon Shine Camo Seat Covers to your truck will reflect your abilities and tell fellow hunters (and drivers) that you never miss your target. As a darker camo pattern, these truck seat covers will look fantastic in darker colored trucks; all the while adding that necessary protection you need. 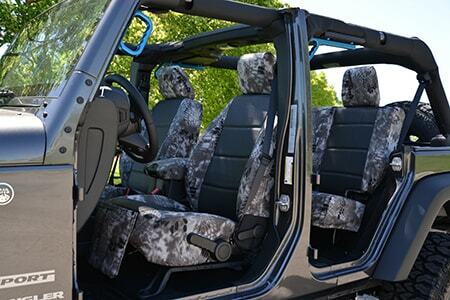 For another level of customization for your truck, you can choose to add a Sport look to your custom camo seat covers. The outside of the seat covers will have a Black accent trim with the Harvest Camo on the inside. Although we’ve only mentioned Harvest Moon here, you can customize your truck with the Sport look with any of our Camo patterns. Photo Credit: Contest Winner Bobbi G.
It is hard to miss -- or ignore -- Muddy Girl Camo Seat Covers in your vehicle. These truck accessories show off your love for Camo and your love for roughing it. This Camo pattern is perfect for those who embrace the outdoors and all of its dirt and mud. The very popular, highly detailed brown camo with its vibrant flares of purple and pink is geared for those that take life on one adventure at a time. Each one, most likely involving getting a little bit dirty, but most definitely involves having a lot of fun. For adventures that require your truck or car, you’ll be happy knowing that your interior is protected with the durable, waterproof, stain and abrasion resistant set of Muddy Girl Seat Covers. Our Wildfire Moon Shine Seat Covers are yet another instance of highly detailed, extraordinarily durable truck accessories that embody the outdoors. The fiery pattern is unlike all the rest with its wooded backdrop featuring vibrant flecks of reds and oranges. These seat covers embrace the wilderness for its greatness and show off your love for all things outdoors. Great for avid campers and hikers who seek to escape the constraints of urban life by heading into the wilderness. The realism of the fiery camo pattern is uncanny, almost to the point that you can hear the crackling of the flames as the Wildfire takes over. Another cool truck accessory to customize your truck with is our Break Up Country Seat Covers. One of the more recent additions to our Mossy Oak line, the pattern still follows the same standards of realism this brand of Camouflage has become known for. Indicative of its name, the Camo pattern depicts the back country filled with larger outdoor elements including bark, branches, and leaves. The detail and realism in the graphics make it possible for hunters to go unnoticed in the outdoor. Add another element of surprise with these seat covers. 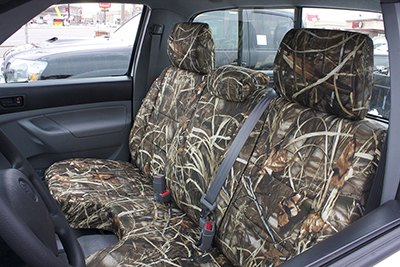 Using the same 600 Denier polyester/nylon blend fabric as our RealTree Camo Seat Covers, your truck’s interior will be fully protected from your hunting gear (and fellow hunters) as you head out on your annual hunting trip. You may already know everything you need to know about Blades Camo and just how popular it is among the hunting community. However, one thing that you may not know is that you can customize your truck with Blades Seat Covers. Each grass blade and thatch of pressed down grass is strategically placed to create the most realistic Camo pattern. Taking things one step further in realism, the Blades Camo design features water edges and flooded fields. 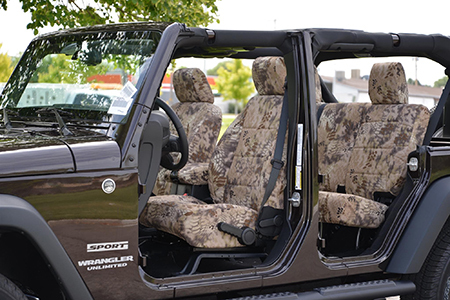 The unique seat covers express the hunter inside by showing it off. As you now know, the original Breakup pattern was so successful for the Mossy Oak brand, but the original one still stands apart from all the rest. A set of Break up Camo Seat Covers will completely transform your truck into a hunting machine ready for a successful season. The high defintion enhanced bark backdrop paired with soft gray oak branches and limbs with shadowy charcoals make for a seriously intense set of camo seat covers. As a Camo lover, this truck accessory will complement your personality and your car’s interior. Now that we’ve gone through the 12 types and the best and cool ways to customize your truck with Camo Seat Covers, it is time to kick it up a notch and give you a quick introduction to ShearComfort’s Luxury Line. We offer many of our Camo patterns in our Luxury Line. While the patterns are the same, there are three upgrades to these truck accessories, qualifying them to be a part of our high end line: quality material and durability, immaculate attention to detail, and an unbeatable aesthetic. Each upgraded feature of these Camo Seat Covers enhances the quality and look of the finished product. This means you not only get the Camo pattern you love and the protection needed, but you also get the luxury you want. Read more about our Luxury Line to see the benefits of upgrading. NOTE: We love our Luxury Line and think you’ll be impressed with it too. We’d like to point out that all our seat covers are made of high quality automotive grade material. All of our custom seat covers also come with a fitment guarantee. Rest assured that any product you order from us, will look amazing and protect your seats as you need them to. 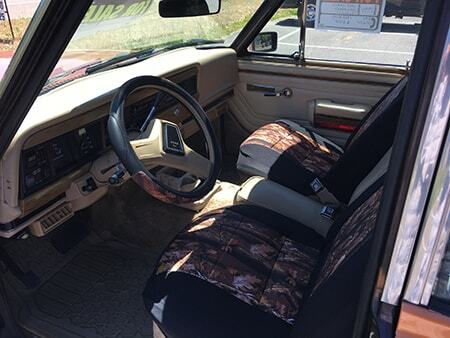 Camo Seat Covers are a fun and effective way of customizing your truck yourself. Fun because you get to incorporate your favorite camouflage pattern into your daily driver and next hunting trip. Effective because you’ll be protecting your seats from stains, spills, and general wear and tear that occurs from daily use. Additionally, if you use your truck for hunting (or work for that matter), this type of usage can cause even more damage long term. Double down with your favorite Camo Seat Covers! 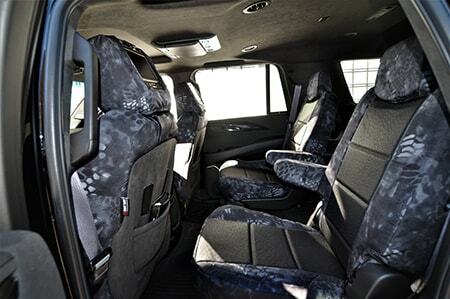 How will you customize your truck interior?